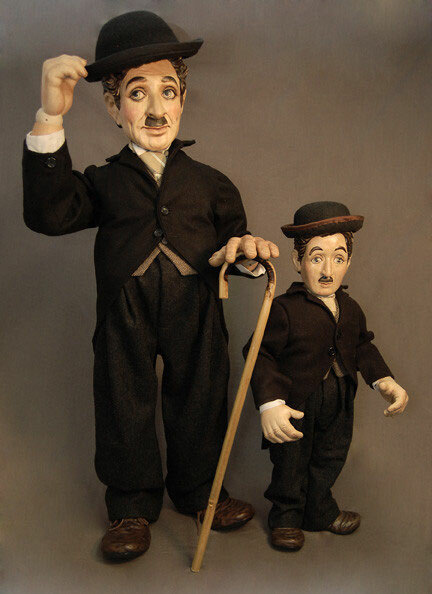 The Little Tramp is available in two sizes. One stands 40” in height and the other is 24″ tall. Each design has 13 moveable joints to allow for maximum poseability. The head, hands and feet are carved from solid maple wood. 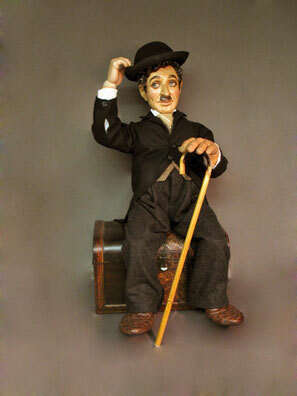 The Little Tramp is dressed in wool pants, a cotton shirt with a silk tie and a tuxedo style wool hat. His outfit is topped off with a felt bowler hat and a bamboo cane. His wooden shoes are stained with a custom colour and have real leather ties in them. Limited Edition of 25 pieces worldwide. 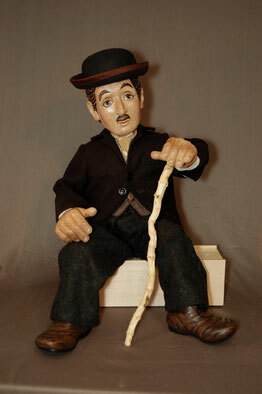 40" Little Tramp is Made to Order. Price $10,500.00 USD Please contact us to order. 24" Little Tramp is Made to Order. Price $3,600.00 USD Please Contact us to order. The 24″ Little Tramp is musical. The music box plays “If I were a Rich Man."